Activity-dependent homeostatic regulation (ADHR) maintains robust neuronal functioning in the face of intra- and extracellular perturbations. Such regulation is critical for normal processing of the nervous system, avoiding pathological states such as seizures, and recovering from injuries, for example caused by a stroke. There is also strong evidence that ADHR, in particular in the hippocampus and neocortex, plays an important role in information processing. The mechanisms of ADHR are complex and mostly unknown. Known models of ADHR mimic experimental data but limitations of these models are poorly understood. To understand ADHR better, we set and solve a prototypical homeostatic regulation problem for a classical Morris-Lecar (ML) model. The solution provides important insights on the geometry and dynamics of ADHR in a generic case. In particular, we clarify existing models of ADHR and formulate specific questions for future experimental and theoretical studies of ADHR. For the ML model, a target for ADHR was set to be an oscillatory regime with a specific average value of the calcium current <I Ca > = <I Ca >*. Conductances of the calcium and potassium currents, g Ca and g K , were regulated according to the equations dg Ca /dt = -α Ca (I Ca - <I Ca >*), dg K /dt = α K (I Ca - <I Ca >*) with positive parameters α Ca and α K . Fig. 1 shows the properties of the regulation and solution to the problem for <I Ca >* = -0.25 and α Ca = α K = 0.005: the target of the regulation is achieved for all perturbations above the dashed line with the slope-1 (Figure 1A). Activity-dependent homeostatic regulation in the ML model. Regulated conductances g Ca and g K are constrained to a line with the slope -α K /α Ca . (A) (g Ca (t), g K (t)) for different initial values ofg Ca and g K (triangle, square and circle), and values of α Ca and α K during regulation. <I Ca > is color coded. When α K = α Ca the regulation returns the system to an oscillatory regime with the target value <I Ca >* = -0.25 for all initial values of g Ca and g K above the dashed line. (B) α K = α Ca = 0.005. (Inset) membrane potential near the transition to oscillations through a supercritical Andronov-Hopf bifurcation. (C) α Ca = 0.005, α K = 0.01. 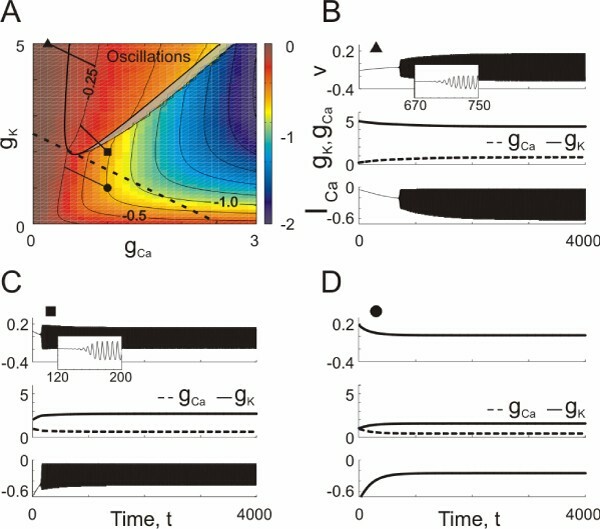 (Inset) membrane potential near the transition to oscillations through a subcritical Andronov-Hopf bifurcation. (D) α K = α Ca = 0.005. The regulation does not restore oscillations though the target <I Ca >* = -0.25 is achieved. Our analysis shows how generic properties of ADHR transform into constraints on the geometry and dynamics of the regulation. Regulated parameters typically belong to a linear manifold of a low dimension in the parameter space of the model, e.g. a line (Figure 1A). Dynamics of the regulation involve transitions between dynamic states of the regulated system. Possible bifurcations underlying these transitions depend on the geometry of the manifold: its dimension and location. Conversely, the information on bifurcations, which is potentially assessable from experiments, constrains the geometry of the manifold that contains the regulated parameters. Finally, we show how the problem of ADHR fits the control theory framework. We establish a modular structure of ADHR and show that the calcium current can play the role of an integral feedback in the sense of control theory. NIH RO1 NS054911-01A1 from NINDS.